This illustration shows the perspective of where the volunteers and camera will be positioned to create the Big Shot photo. Once the sun sets on the National Mall on Sept. 26, hundreds of visitors will rise and shine their lights on an important landmark. 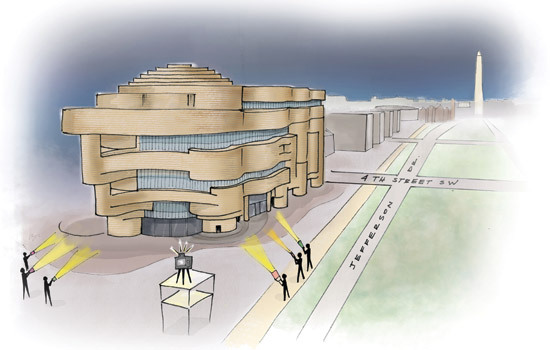 Volunteers armed with flashlights and camera flash units will illuminate the Smithsonian Institution’s National Museum of the American Indian to make RIT’s 25th Big Shot photograph. The Big Shot is a massive nighttime photo shoot that relies on volunteers to provide the primary light source for the photograph. RIT professors shoot an extended exposure as volunteers “paint” the subject with light. Since the project’s inception in 1987, the event has hopscotched to several national landmarks and twice crossed the Atlantic Ocean. Through their viewfinders, Big Shot photographers have captured landmarks such as the Alamo, the U.S.S. Intrepid, the Royal Palace in Stockholm, Sweden, and George Eastman House International Museum of Photography and Film, while drawing thousands of participants throughout the past two decades. “For me the project is about challenges, teamwork and community,” says Dawn Tower DuBois, professor at the National Technical Institute for the Deaf and one of the Big Shot organizers. “At our very first Big Shot at Highland Hospital in 1987, we had about 35 people come out in below-freezing temperatures. Last year, The Big Shot along the Erie Canal in Pittsford drew a crowd of 700 people. The response from the community is really something special. This is what keeps us coming back year after year.” The National Museum of the American Indian will be the focal point of this year’s photograph with the Washington Monument in the background. The curvilinear and domed museum has an exterior cladding of Kasota limestone, which gives the building an appearance of stratified stone. “We were drawn to the building’s architecture and the color and the texture of the stone,” says Bill DuBois, RIT chair of visual media photography and one of the Big Shot organizers. “It’s a unique structure for the National Mall. We want to bring that structure to life in this photograph. One of our challenges will be to balance the exposure of the museum and maintain the Washington Monument in our viewpoint at a proper exposure as well.” The DuBoises and Michael Peres are the longtime project organizers. As the trio prepares for the photo shoot, the National Museum of the American Indian is celebrating its fifth anniversary of the opening of the flagship museum on the National Mall, which is located just south of the U.S. Capitol building. “The Smithsonian’s National Museum of the American Indian is pleased to be participating in the 25th Big Shot photography project, joining other venerable national and international locations in its Big Shot portfolio such as the Royal Palace in Stockholm, and Pile Gate in Dubrovnik, Croatia,” says museum director Kevin Gover (Pawnee/Comanche). “This unique event that will involve our museum members and the local Washington, D.C., community will be part of our calendar of events.” The general public is invited to participate. With nearly 4,300 RIT alumni in the Washington, D.C., area, many graduates are expected to attend. RIT is chartering a bus for students. RIT President Bill Destler, his wife Rebecca Johnson, and Jeremy Haefner, RIT provost and senior vice president for academic affairs, will participate in their first Big Shot. To commemorate the project’s history, organizers are collaborating with RIT’s Open Publishing Lab to produce a coffee-table book. “It will be a full-color hardcover book in a landscape format featuring all 25 photographs,” says Peres, chair of RIT’s biomedical photographic communications. “Dawn, Bill and I will be the main contributors. We’ve also asked some of those people who’ve participated in numerous Big Shots to share their impressions through a series of essays.” The book’s sponsors are Nikon Corp., Xerox Corp. and Frank Cost, interim dean of RIT’s College of Imaging Arts and Sciences. It will be available for purchase in late October. For more information, and to view past Big Shot photos, visit www.rit.edu/cias/bigshot. Want to be a part of the 25th Big Shot? If you would like to participate in the event on Sept. 26, details are available at www.rit.edu/alumni/bigshot09. Current RIT students can reserve a seat on the bus by calling (585) 475-2681 until Sept. 15. Fifteen years ago while conducting research in Washington, D.C., Jason Younker would often look out on the National Mall at the site of the future National Museum of the American Indian. In September, he will return as this Smithsonian museum celebrates its fifth anniversary and is the focus of RIT’s 25th Big Shot photograph. “As a representative of RIT’s faculty and the Native American community, I am proud of our institution for recognizing so openly the contributions and resilience of America’s first peoples,” says Younker, assistant to the provost for Native American relations and RIT assistant professor of anthropology. At the Big Shot reception, Younker will give a Native American blessing and share a story that his uncle told him about respecting the past in the present. Leah Shenandoah, a metals and jewelry graduate student in RIT’s School for American Crafts, is presenting the museum with one of her handmade creations. Shenandoah created a rabbit fur Couture hood with sterling etched beads and pearls and a medicine pouch (inset photo). Shenandoah, a member of the Oneida Iroquois Wolf Clan, says her ancestry has been a great influence on her life and art. “My grandmother was a Wolf Clanmother and had a trading post,” says Shenandoah. “She sold Native jewelry at exhibitions and cultural events around the country for more than 40 years. Selling art at her booth helped define me as an artist, as she always had great pieces for sale.” Shenandoah will also perform several songs at the reception with her mother, Joanne Shenandoah, an award-winning singer, songwriter and performer. The two have been performing together since Leah was five years old. Kyleen James, a photo illustration student from RIT’s School of Photographic Arts and Sciences, will present the museum with one of the photographs she captured for a project on Native American dance. James is a member of the Passamaquoddy tribe.